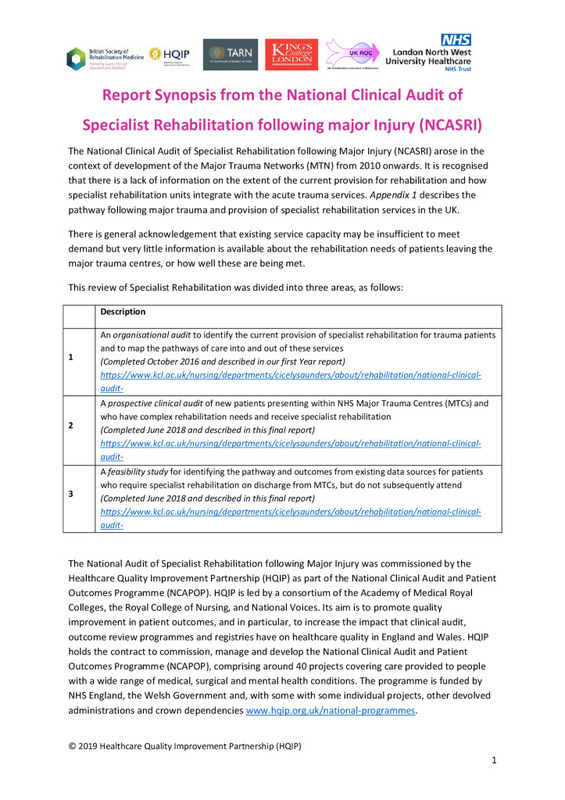 This is a synopsis of the third and final report on the provision of specialist rehabilitation following major trauma. Major trauma can lead to a wide range of injuries resulting in a diverse range of impairments and rehabilitation needs. To ensure that patients receive the services they require in a timely fashion, it’s important to identify and understand the complexity of their individual requirements for rehabilitation and direct them to the most appropriate service as they leave the major trauma centres. The report found that access to specialist rehabilitation appears limited and needs much closer attention paid to the implementation of the standards that already exist. There will be different models of improving such access, depending on the set up of the services in the different areas of the country. Nevertheless, when designing and managing trauma networks compliance needs to be reviewed to these standards to see how it can be improved.